A sandstorm in July of 2014 at the Nazca desert exposed previously unknown, large scale, geoglyphs believed to have been fashioned during the contemporaneous overlap of the Paracas and Nazca cultures. 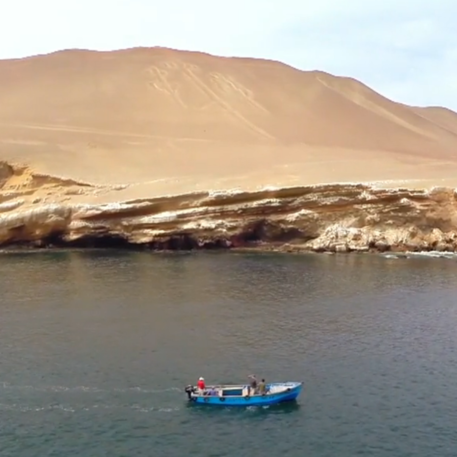 In a recent replay of the Travel Channel’s “Expedition Unknown” Episode Secrets of the Nazca (Release Date: 19MAR15), host Josh Gates takes a short coastal sea excursion along the northern coast of the Paracas Peninsula at Pisco Bay in Peru. He is joined on a small boat by local “Archaeologist”, Rolando Aybar. In the short video ”Costline Candelabra”, Josh and the Archaeologist discuss the alignment relationship of the Paracas cultures’ Candelabra and the Nazca cultures’ Hummingbird geoglyphs. Unfortunately, the claim made by the “Archaeologist”, and ostensibly unverified by Mr. Gates, is erroneous. 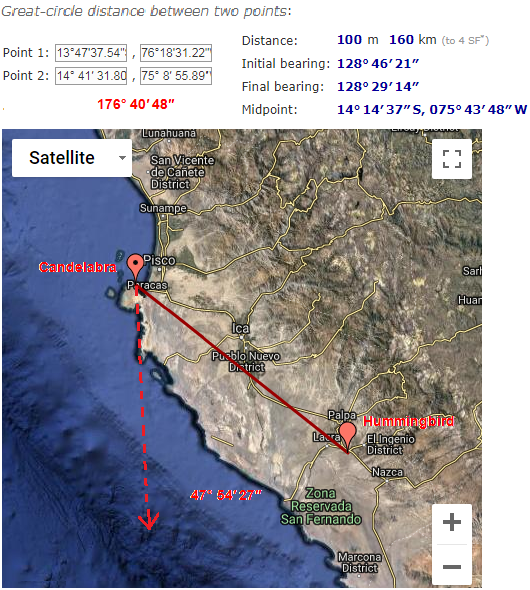 The ‘elongated column’ points into the open South Pacific Ocean off the western coast of South America, some 47° 54’ 27” (47.9075°) west of the Candelabra - Hummingbird Line. Style over substance…to what end?